The process of connecting iPhones and iPads is basically exactly the same; the menus have the same layout, and the same settings are required. For name, write your actual name, like "Firstname Lastname". 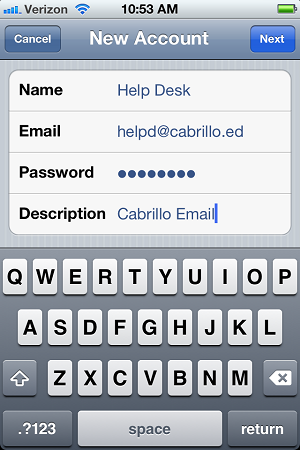 Then enter your Cabrillo network/email password. For description, "Cabrillo Email" works well; make sure you can differentiate it from other accounts you may have on your phone. Scroll down further; the next setup section is "Incoming Mail Server". 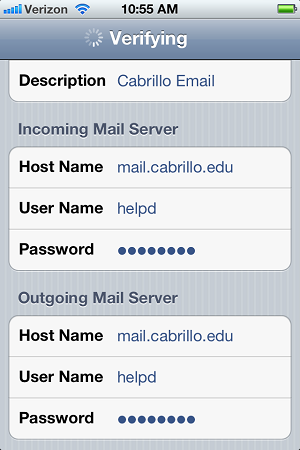 Host Name is always "mail.cabrillo.edu". 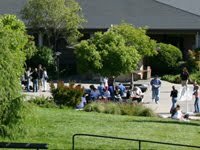 For username, simply enter your Cabrillo username, which will be the same as your email, but without the '@cabrillo.edu' part. For password, enter the same password as you entered above. The 'Outgoing Main Server' info is identical to what you just inputted above in 'Incoming Mail Server'. 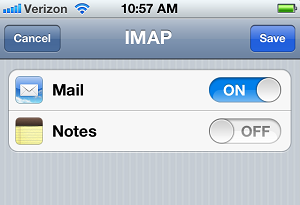 In the next section, titled "IMAP", turn Mail to the "ON" position and Notes to the "OFF" position. Now hit "Save" and you're finished!